Please make a donation on our behalf here. THON is the Penn State IFC/Panhellenic Dance Marathon, the largest student-run philanthropy in the world. Each year, thousands of Penn State students work together to raise money for THON, which benefits the Four Diamonds Fund at Penn State Hershey Medical Center. THON also generates awareness for the fight against pediatric cancer. The Four Diamonds Fund covers all of the costs of treatment for the Four Diamonds Families that insurance does not cover, and also funds pediatric cancer research.The Ski Club is part of this critical mission. We work throughout the year to raise as much money as possible for THON. We go canning on street corners and in front of stores during the canning weekends, traveling throughout various states, such as Pennsylvania, New Jersey, and New York. We also fundraise by sending letters out to our friends and families for donations. We have grown in the past few years raising more money while recently “adopting” a Four Diamonds Family. The yearlong effort to raise money and support for THON culminates during THON weekend, which is the 46-hour, no sitting, no sleeping dance marathon. We spend our time in the Bryce Jordan Center during that weekend, showing our support for all the dancers and Four Diamonds Families that are present. If you would like to join us or are interested in learning more about what the Ski Club does for THON please contact our THON Chair Bri Bannister at bnb5296@psu.edu. If you are unable to donate your time, but would like to donate to THON through the PSU Ski Club, be sure to select Ski Club as the organization you would like to credit! Hunter was diagnosed with AML Leukemia on August 22, 2012 just before his thirteenth birthday. Within just a few hours of receiving the news we were on our way to Penn State Children's Hospital. Hunter under went 3 rounds of chemo. (he was in the hospital about a month each round and then home for a few days then back in for another month) After the first 2 rounds of chemo the doctors still found cancer cells. At that point the doctors told us Hunter was going to need a bone marrow transplant. They tested Hunter's brother, Cody to see if he would be a match for Hunter. We were thrilled to get the news Cody was a match however, just a month before Hunter was diagnosed with leukemia Cody was diagnosed with Crohn's disease and we were told Cody was not able to be the donor, we were devastated. We were blessed the doctors were able to find an unrelated donor that was a 10 out of 10 match, the best you can have besides a sibling. After his third round of chemo we finally were told that they didn't detect any cancer cells and Hunter was in remission. We were able to enjoy having Hunter home with us for several weeks. Then on January 23, 2013 Hunter went back into the hospital to be prepped for his bone marrow transplant. He under went his fourth round of chemo, this by far was the hardest for him to take. Hunter was in the hospital for about 6 weeks. Once he was released from the hospital we need to stay in an apartment up at Hershey that kept him within minutes from the hospital. Hunter had to stay isolated for the first 100 days after his transplant. By mid May we were able to bring Hunter home to stay. Hunter has follow up visits once a month and remains in remission at this time. The 2015/2016 THON season was a good year for Ski Club's considering 2 canning weekends being canceled. We raised $11,348.58, contributing to the overall of $10 million. We hope to raise more next year with all canning weekends. 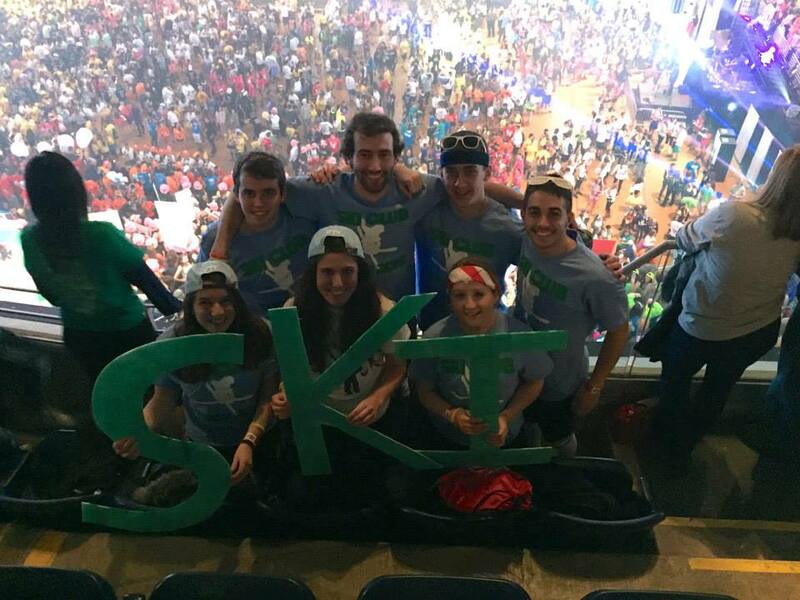 Evan Balas and Kelly Hensler represented Ski Club as dancers THON weekend. Thank you to everyone who went canning with us, hosted canning trips, donated, attended meeting, or just supported the Ski Club dancers from the stands. It was an amazing year and we hope to grow even more next year.